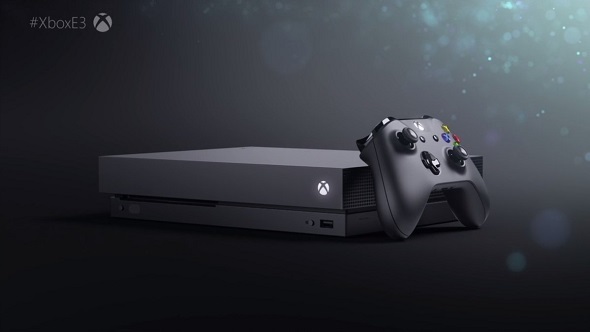 Before it dwarfed head of Xbox Phil Spencer, the enormous 4K screen that formed the centrepiece of Microsoft’s E3 conference stage was used to illustrate the progression of its consoles’ resolutions. Starting with a tiny 640×480 rectangle (which is still bigger than that time we tried to play Half-Life on a 486), the video stepped up through 720p and 1080p examples, before erupting into Microsoft’s histrionic – and extremely loud – reveal of Xbox One X. That ridiculous name is sure to result in a lot of disappointment at Christmas when people unwrap their presents and find an accidentally-ordered Xbox One S instead. Such a catastrophe could be easily avoided by uttering the much more parsable, “I would like to buy a PC, please,” especially given that most of the 42 games announced today will be playable on one anyway. Want to look your best in 4K? Have a look at our guide to the best Minecraft skins. Microsoft’s Gaming On Windows 10 initiative demands that be the case, even if it means the company is left with a paucity of console exclusives (despite a concerted effort to say the word “exclusive” as many times as possible throughout the briefing by mixing it up with other words like “console”, “first,” and “worldwide”). But while the lack of meaty console-focused games and the all-but-whispered confirmation of Xbox One X’s $499 price tag weakens the Xbox family’s position against its competitors, it’s something of a coup for PC players. Not least because it means that we get a full-fat Forza this time around. 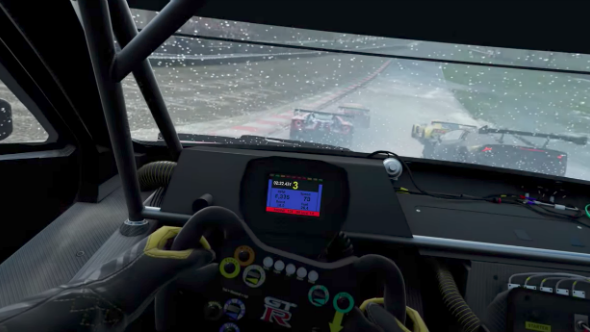 And Forza 7 looks pretty wonderful, actually, shored up by some dramatic bad-weather effects, dynamic puddles that aren’t just baked into the track, and truck racing. Turn 10 Studio’s efforts certainly look like giving Project Cars 2 something to worry about, at any rate, and the sheer enormity of the series’ stock these days was illustrated by the world debut of Porsche’s 911 GT2 RS, which turned out to be hidden in a rotating box in the stage. After a prolonged absence, Crackdown 3 popped its head out of the workshop for a brief showing that was, despite undeniably bombastic, rather overshadowed by Terry Crews’ performance at the beginning of the trailer. There was also the awkward fact that we didn’t even get to see a brick knocked out of place – much less any collapsing skyscrapers – in any of the gameplay shown. Even so, we’re still very excited about this one, and it’s another major title to eschew console exclusivity. 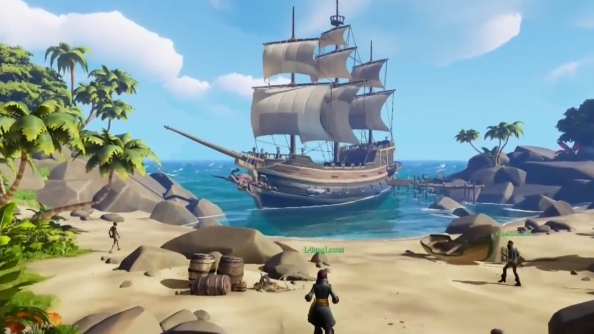 As is Rare’s Sea Of Thieves, which continues to entertain in principle, even if we’re dreading the reality of dealing with uncooperative crewmates. All of these games, until very recently, might well have remained locked off on Xbox or emerged months later as a half-hearted port. Not so anymore. Microsoft’s focus on Xbox One X’s 4K capabilities meant that there were plenty of eye-searingly good-looking games during the briefing, multiformat or otherwise. Among them were: Anthem, BioWare’s handsome confluence of Destiny, Titanfall, and Horizon; 4A Games’ atmospheric but probably optimistic vision of Metro Exodus; and Assassin’s Creed Origins, whose subtitle boldly ignores the inherent irony of its attachment to a series that seems to make very little progress each year. All very pretty, sure, but what better game to show off the potential of 4K than… erm, Minecraft? Mojang’s Super Duper Graphics pack transforms the famously luddite phenomenon into something a little less primitive with 4K textures and some lovely lighting. It’s a big shift for a series that has stubbornly stuck to its utilitarian visuals for so many years, but arguably of more note is the fact that the game is going entirely cross-platform. Bringing mobile, console and PC players together is a bold illustration of the inclusive ethos that increasingly defines Microsoft’s outlook. Sure, there’s the chance that cross-platform development could throttle the PC version’s full potential, but with Xbox One X’s reasonably sturdy specs that’s becoming a less prominent concern. And any endeavour that gets great games that would have only existed on console onto our hard drives can only be a good thing.